(0 Customer Reviews) | Write Review 49 issues per year GARAVI GUJARAT is one Britain’s oldest and biggest selling Asian titles. 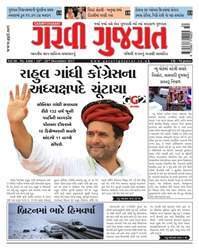 Published weekly in full colour in both English and Gujarati it is the biggest selling Gujarati publication outside India. It has extensive coverage of India, reports on Asian news in the UK and covers the global diaspora, giving it a breath and range of stories few other publications can match. A family-centered publication, it has sections relevant to each member of the household and also reports extensively on spiritual affairs and cultural events close to the Gujarati community in the UK and US. It also has sport, fashion, health and Bollywood, among its weekly offerings. Garavi Gujarat is known around the world and is most famous for the quality of its Gujarati language prose and the magazine's founder and editor-in-chief, Ramniklal Solanki was awarded a CBE for services to the Asian community and publishing. His diary and aphorism columns are one of the most eagerly anticipated and widely read personal dispatches of any writer anywhere in the world. Garavi Gujarat Weekend - a stimulating blend of news, personal finance and lifestyle features in you inbox every week. ePaper access - the digital replica of the printed newspaper free access for one month. 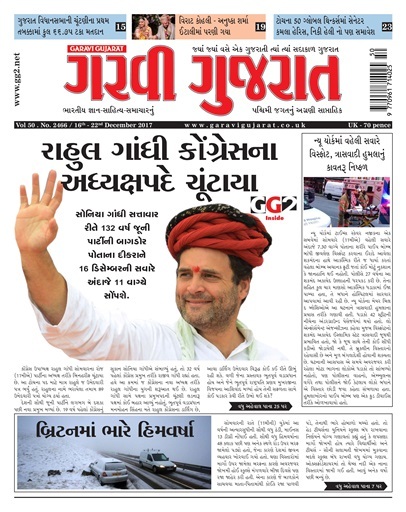 You'll receive 49 issues during a 1 year Garavi Gujarat Magazine magazine subscription. You'll receive 49 issues during a 1 year Garavi Gujarat Magazine magazine print subscription.